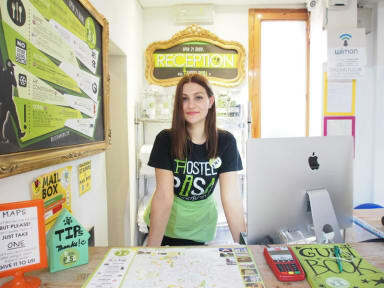 Hostel Pisa kohteessa Pisa, Italia: Varaa nyt! The hostel is amazing! 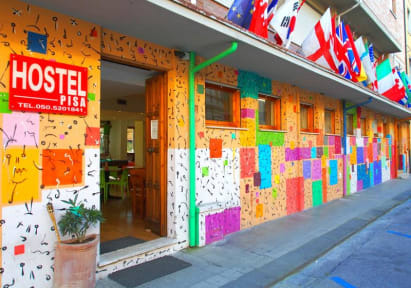 The atmosphere there is so friendly and welcoming, and I have never experinced such in other hostels. Location is near from everything and the staff is very friendly and helpful. I enjoyed my stay a lot and so did my friend! If ever coming back to Pisa I'll stay in this hostel. We arrived to Pisa late in the evening, so we were really glad that the hostel was located near the airport and that it had a 24 h reception. The dorm rooms were good: a private toilet/bathroom was included (instead of one shared for a whole floor) and they had proper beds and lockers. The essentials could be bought from the reception if needed, which was also nice. Still, probably the most awesome thing was the outdoor terrace that had a great relaxed mood. The staff was always really helpful. Stayed for one night in a private room. Fantastic location close to the airport and the city centre. Good value for money. The courtyard with tables and chairs is cute! Location is just a stone throw away from the railway station, and only 15min by foot from the airport. Easy to get to, very friendly staff and the atmosphere at the lounge area was great all the time. Conveniently power outlets in each bed (for charging your phone) and the ensuite bathroom was very nice.